Today, the 29th of August, is the third anniversary of Stewart losing his fight for life. We still think of him every day. Sometimes with sadness as we recall his time in hospital trying to beat the horrible disease that is bowel cancer. Sometimes with happiness as we remember the happy, healthy, smart, witty person that Stewart was. We also remember the strength he showed throughout his illness. He hated being called brave, but the bravery he showed towards the end of his life put us all to shame. No one individual should have to suffer so much pain, but he bore it without complaint. When we were trying and failing to hold back tears, he was the only one that managed to stay calm. In short, he was a great person to know. Much has changed in those three years. The world has become a scarier place made even more frightening by the fact that a very scary individual is attempting to become president of the good ol’ U S of A. Donald Trump is quite scary too. One thing that hasn’t changed is the medical profession’s belief that bowel cancer only affects older people. Over the past three years, I have written about some of those who have contracted the disease; some as young as 18. That is why this blog continues. Okay, some of the rants can get a little silly, but behind it all is the message that bowel cancer can hit anyone at any age. Stewart was diagnosed at 26. He had been displaying symptoms for about a year before that diagnosis was made. In that year he had been to see a doctor many times for help. It wasn’t always the same doctor he saw. It took a year before one of those doctors recognised the symptoms of bowel cancer. Why was that? It was because most practitioners in the medical profession believe that bowel cancer is a disease found in older people; it does not hit anyone so young. Those doctors didn’t think it necessary to carry out tests for bowel cancer in someone of Stewart’s age. They need to be told that they are wrong. This blog will continue, in Stewart’s memory, to try and get the message across. It is important that as many people as possible are aware that bowel cancer can hit anyone; age is irrelevant. 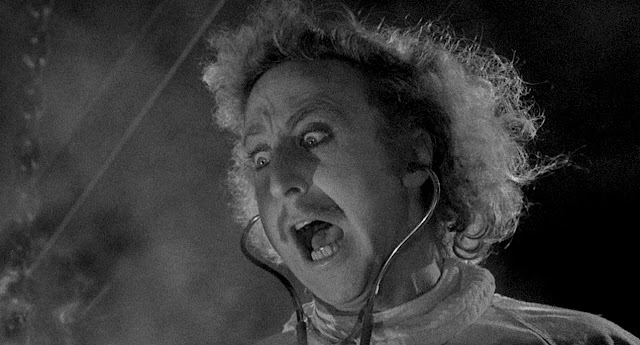 Because it happened on the same date as Stewart dying, I will always remember the date that Gene Wilder died. What do you notice about that list? Yes, you at the back? Yes, indeed, they are all comedies. I do like a good larf. Anything else? Correct. Three of them are films which featured Gene Wilder. Does that mean that he was one of my favourite comedy actors? I did enjoy his performances; if you wanted neurotic, he was your man. However, he was never the main reason why I enjoyed the films included in my list. My main reason for liking those films was the fact that Mel Brooks was the man behind them. I might also have included Silent Movie or High Anxiety; both Mel Brooks films, but no Gene Wilder in sight. Later in his career Wilder starred in a few so-so comedies with Richard Pryor. He also fancied himself as the head honcho by occasionally producing, writing and starring in his own projects. Some of these were well received, while others - Sherlock Holmes’ Smarter Brother, for example - were rightly slated. The work he did in his early career was the best; later stuff, to me, was less enjoyable. I did like him. Honest, I did. However, there was one thing about him that I found ridiculous. It was something that, for me, got in the way of every performance he ever gave. What, I hear you ask. That crazy-looking combed over hairstyle he always wore. The thatched roof look just isn’t cool. Everton had efforts from Romelu Lukaku and Ashley Williams cleared off the line before they got a penalty when Williams was tripped by Phil Bardsley. Shay Given pushed Leighton Baines' spot-kick on to a post but the ball then rebounded off Given's head and in. Stoke's Marko Arnautovic hit the crossbar, but Everton held on to win. Oldham went in front in the fifth minute when Marc ‘Alarm’ Klok delivered a free-kick from the right to the far post, where unchallenged defender Peter Clarke scored with a downward header. Bradford dominated the rest of the opening period as the visitors' defence survived a series of narrow escapes. Ex-Motherwell keeper Connor Ripley made a brilliant one-handed save to deny winger Mark Marshall, Timothee Dieng and Josh Cullen both had shots deflected for corners, and Billy Clarke missed a good chance when he turned James Meredith's cross wide. Oldham somehow held their lead until half-time, but Bradford deservedly equalised after 57 minutes when Ousmane Fane dragged Cullen to the ground and Clarke scored from the spot. Bradford continued to dominate, but could not turn possession into goals as Oldham's defence held firm. Rovers started in red-hot fashion and took the lead after just 34 seconds. Andy ‘Moon River’ Williams lashed home a fine volley on the angle after meeting John ‘Mary’ Marquis' knock back from a corner. But Yeovil were much the better side in the first half without truly testing Rovers goalkeeper Marko Marosi. They were made to pay when Rovers doubled their advantage in the 54th minute, James Coppinger volleying in from 15 yards. Yeovil hit back two minutes later as Hedges intercepted Matty Blair's careless backwards header and fired past Marosi. The afternoon got a little easier for the hosts when Bevis ‘Robert’ Mugabi saw red in the 76th minute following his second booking for dragging down the breaking Williams. And there was no stopping the Rovers striker who calmly slotted home from close range eight minutes from time before sealing his hat trick by heading home Tommy Rowe's cross unmarked in injury time. The first real opening for Queen’s didn’t arrive until the 25th minute. Josh Watt made great ground down the left to get in a cross from the byeline, and Aiden Malone worked wonders to get in a shot that was blocked for a corner. And from the corner the Spiders scored! Darren Miller’s kick found Malone at the far post, where he volleyed a shot behind Livi goalkeeper Liam Kelly. It took a deflection on the way in, but none of the home side fans was complaining. The home side started the game well, but as the first half progressed Elgin looked better on the ball as the Loons struggled at times to get things going on the park. Midway through the first half Chris McLeish opened the scoring for Elgin when his persistence at the edge of the box let to him getting a shot away which beat Grant Adam in the Forfar goal. On thirty-eight minutes the Loons equalised when Thomas O’Brien drilled a peach of a shot into the Elgin net from outside the box. However, Forfar conceded again three minutes from half time when a cross field ball to the right was squared by Craig ‘Tommy’ Gunn for McLeish to net his and Elgin’s second. Forfar levelled the game again five minutes into the second half when Josh Peters evaded a couple of challenges to net from inside the box as the Loons began to show a marked improvement on their first half showing. Elgin’s McLeish was then denied what would have been a fine hat trick when Adam pulled off an excellent save to touch the Elgin striker’s shot over the bar. With the game in the balance at two goals each, and with both sides matching each other well, it took a touch of class for the Loons to take the lead for the first time in the game when some neat passing on the left released O’Brien who swaggered into the box leaving some bemused Elgin defenders in his wake before dispatching the ball past goalkeeper Cameron McKay. Oh well. Three correct predictions (with one nearly correct and one totally wrong) would normally give us a profit on our £2.20 bet. Unfortunately, the odds were... well... a bit rubbish. This week, the only league games taking place at 3pm on Saturday the 3rd of September are in English leagues 1 and 2 (or 3 and 4 in old money). It’s all to do with early round matches in the English and Scottish FA Cups. At least that is how they used to be known; now, it’s the Emirates Cup in England and in Scotland we have the Irn-Bru Cup. Ye gods and little fishes! Any road up, there are 19 games for The Grambler to select from, which five did he/she/it randomly pick? Oh dear. A bit too whopping if you ask me. Teaser time. Yay! Last week I asked you which London-based club, in 1888 dropped the words ‘St. Andrew’s Church Sunday School’ from its name. It was a team founded in 1879 as Fulham St. Andrews Church Sunday School F.C. Yep, Fulham F.C. They are known as the Cottagers because their ground is called Craven Cottage and not for the reason suggested by a Mr. G. Michael. Okay, how about one for this week? Who was the last player to score over 40 goals in an English top flight season? The fact that I worded it that way should give away the fact that it was before the first division changed into the Premiershit that we all know and hate. And finally, Cyril? And finally Esther, I am indebted to a Mr. U. Tube who this week provides our finishing link. Ladeez and genullun, please enjoy a short tribute to Mr Gene Wilder .